Under Armour "won" the NBA Finals as spokesman Stephen Curry and his Golden State Warriors defeated Nike-backed LeBron James and the Cleveland Cavaliers. Now, the battle between Nike and Under Armour is set to move from the hardwood to the fairway. The world's top golfer -- Rory McIlroy -- is a Nike (NKE) endorser. And he's the favorite to win the U.S. Open at Chambers Bay in Washington this weekend. But Under Armour (UA) sponsors golf's second-ranked player -- Masters champion Jordan Spieth. His odds are only slightly lower than McIlroy's. Of course, nether could win the U.S. Open. There are 154 other golfers teeing it up after all -- including Tiger Woods. 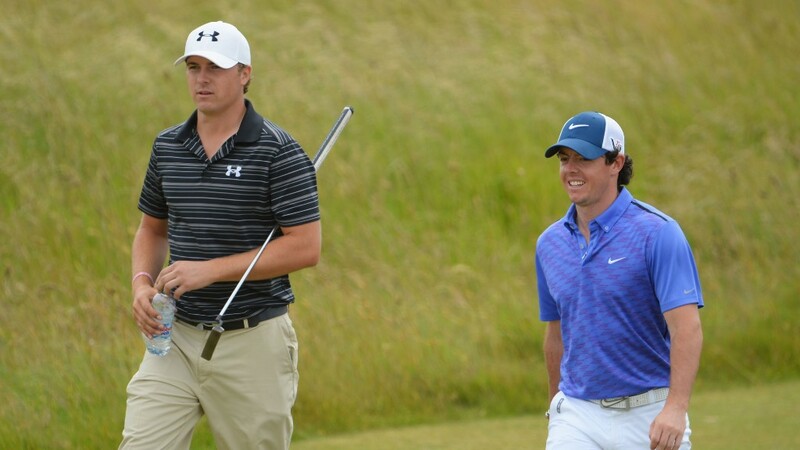 Still, Nike and Under Armour must be hoping that these two young stars -- McIlroy is 26 and Spieth is only 21 -- wind up being the Jack Nicklaus and Arnold Palmer of the 21st Century. McIlroy inked a 10-year, $200 million deal with Nike in 2013 while Spieth signed a new 10-year deal with Under Armour earlier this year. The financial terms of Spieth's contract were not disclosed. Golf needs superstars to make it more interesting to a mass audience. Tiger Woods used to dominate the sport the way Michael Jordan did basketball. Do we even need to use his last name? Tiger is enough. But Tiger hasn't been the same since the scandal in his personal life more than five years ago. Injuries are taking their toll on the 39-year-old as well. Related: Can Golden State's Stephen Curry be an ad star like LeBron? Tiger is now ranked 195th in the world. He hasn't won one of golf's four major tournaments -- The Masters, U.S. Open, British Open and PGA Championship -- since June 2008. Nike is sticking with him though. Even though he's been struggling, Nike signed Tiger to a contract extension in 2013. It makes sense. McIlroy and Spieth aren't in Tiger's league -- yet. McIlroy has won four majors. Spieth has one. But both seem to resonate with fans and have the potential to be as good as Tiger. McIlroy was chosen by gaming company EA (EA) earlier this year to be the new cover boy for its popular PGA Golf game. Tiger had been the face of the game from 1998 through 2013. And ratings for McIlroy's PGA Open win last year were the highest for that tournament since 2009 -- despite the fact that Tiger only played the first two of the four scheduled rounds because he missed the cut. Spieth's performance at the Masters had people glued to their TVs too even though there wasn't much suspense. Ratings for the final round of the Masters were up 26% from a year ago as Spieth tied Tiger's course record from 1997. It seems that people like to watch a coronation. But will the success of McIlroy and Spieth lead to a significant increase in sales and profits for Nike and Under Armour? That remains to be seen. Nike's golf business has actually been struggling lately. Sales fell slightly in its most recent fiscal year. That was the only product line at Nike to post a sales drop. And it's too soon to tell what impact Spieth will have on Under Armour. The company has simply said in earnings reports and conference calls that the golf business is growing. But it does not give any concrete numbers. Still, it's worth noting that a company that has ties to neither McIlroy or Spieth could wind up getting the biggest boost if these two help bring about a golf renaissance. Callaway (ELY), the maker of Big Bertha drivers, Odyssey putters and other golf equipment, is the only public company that's devoted entirely to golf. Its stock is up nearly 20% this year. That's better than Nike -- and only slightly behind Under Armour.